Is the yeast you are utilizing alive and healthy? You may check yeast viability monitoring alive versus dead yeast, but do you know anything about the metabolic condition of the yeasts? Improve the quality control of your yeasts for the optimal fermentation and the best beer! The yeast vitality can be measured using CDR BeerLab®, a system which enables you to carry out a wide panel of chemical analyses on beer, wort and water, using a single instrument, in a process that is faster and simpler than traditional methods. 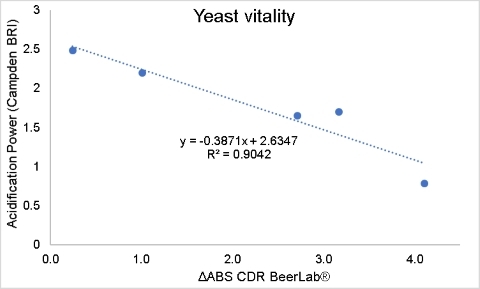 The CDR BeerLab® method for the determination of Yeast vitality is precise and repeatable as is established in the report “Evaluation of new features (VDK, yeast vitality) of the CDR BeerLab® Analyser” performed by the international reference laboratory Campden BRI, innovation, research and technology centre for the food and drinks industry. Five yeast slurry samples were analysed in the Camapden BRI laboratories in triplicate for yeast vitality using the CDR BeerLab® equipment and the yeast acidification power (AP) test, one of the most common vitality tests used. The CDR BeerLab® results were similar to those for the AP test methods (correlation R2 = 0.90). Active yeast will drive down the pH of a proper solution containing glucose. Yeast that have high vitality causes a bigger increase of acidity while a dead yeast doesn’t change the pH. pH variation is determined through a colorimetric acid-base reaction. The reuse of yeast is useful as it enables considerable savings and can actually improve the organoleptic properties of beer. When reusing yeasts it is important to pay close attention to recovered cell efficiency, which is why determining viability is so useful. However, counting cells or determining viability is not sufficient for determining whether recovered substrate cells are capable of enabling alcoholic fermentation. Therefore, yeast vitality must be determined. Use it on liquid yeast. Performing the test on dry yeast it is necessary to dissolve it with distilled water and let it rehydrate for at least 30 minutes. Yeast Vitality was last modified: March 21st, 2019 by CDR s.r.l.